Although conFAB’s production of A Thousand Kindnesses at the Toronto Fringe Festival contains a heartfelt and timely message about the plight of refugees and the power of kindness in everyday life, the way this message was delivered — through uncontextualized first-person accounts collected from real refugees — left me feeling profoundly uneasy. I’m sympathetic to the difficulty of performing a one-woman show. Happily, Rachel Jury delivered her lines with well-practiced fluency. In terms of movement, I would have liked to see her shift to a different part of the stage or incorporate more physicality into her characters. The jumps between refugee stories and Jury’s own autobiographical tales often felt abrupt; these narratives were more satisfying when they were individually allowed to gain some momentum. I thought Jury was at her best when relating stories from her own life, particularly the short bit about the chatty man who lived in her apartment building. However, the bulk of A Thousand Kindnesses focused on stories from refugees. Unfortunately, I found it extremely jarring to hear the stories of Black and Brown refugees — stories of border crossings, forced labour for the military, escaping war-torn countries at any cost — told as first-person experience by a White woman without any clear cultural, ethnic, or experience-based claim to them. I don’t wish to personally insult or attack Jury in any way; no doubt she was motivated to perform this piece based on her honest compassion for people who are enduring extreme circumstances. However, I question anyone’s right to tell refugees’ stories in the style of direct lived experience — according to the program, these were true stories from real people — without having lived through it themselves, or at least providing the names of the people who did, and offering some kind of context for the way these stories arrived on the stage. If Jury had framed the refugees’ stories in her own experience, describing her relationship to the people she interviewed and altering her storytelling method to honour their voices, instead of directly presenting their voices as her own — recounting their lived narratives in exactly the same style as actual anecdotes from her own life — these problems might have been circumvented. I wanted her to acknowledge onstage that she was telling stories that weren’t experienced by her, and to shift attention to the people who did. Whatever Jury’s intention, I walked away from the show feeling strongly that the stories of refugees have been appropriated for, rather than incorporated into, the show. The use of ethnic accents and fractured English for refugee characters, which I assume were used to increase authenticity, did not diminish this impression. Overall, I applaud this play’s message that kindness has the power to transform lives. If more people acted with kindness, we would live in a better world. Regardless, I remain unconvinced about the appropriateness of the relationship between message and messenger. Tickets are $12 at the door and in advance. The festival also offers a range of money-saving passes for serious Fringers. Thank you so much for your review. I welcome this conversation and see it is part of the work of the show. Since the conception of the show I have questioned my role in the telling of these stories, your concerns have indeed been mine at times. My response to these questions is to take a very specific and subtle style of verbatim performance. I do not play characters or do accents rather attempt a representation of the stories and the people who have been so kind as to gift me their stories. Artistically and ethically I have sort to respect, honour and celebrate the stories and the people who have ownership of these stories. I am a conduit for the stories not an owner of them. The stories are part of a wider quest whereby I am literally collecting a thousand of stories of kindness experienced by people during times of conflict as I perceive these stories to most clearly demonstrate the power of kindness. Your response to the show demonstrates to me how far we have to go before we understand ourselves as equal, connected and part of the same story. It indicates to me how far we have to go to reach the sort of equality between peoples that your response seeks to find. It is an important conversation to have and I hope the show continues to stimulate discussion and reflection. Rachel has been leading anti-racist and community integration initiatives through arts projects for over a decade. In 2004, there were many empty apartment buildings in Glasgow, and the English government decided that to reduce housing costs they would send asylum seekers to live in these buildings, which happened to be in some of the poorest, most deprived communities in the UK. So, with little concern for the effect this would have on either the local communities or the asylum seekers themselves, some 2,000 people were sent to live there – pretty much overnight, amidst very negative media coverage. Within a very short time, huge tensions had built up and one of the asylum seekers was murdered. This prompted the Scottish government to take action and they began funding arts programmes and other similar community reconciliation initiatives. 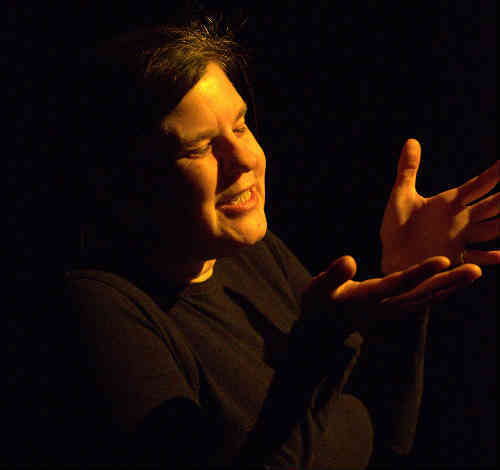 Rachel, along with other artists, founded conFAB (conFAB.org.uk) to promote healing and understanding through community theatre. Over time, relationships were transformed to such an extent that people who had refused to touch the same water jug as the newcomers ended up drinking with them, and when the English government began a controversial practice (now stopped) of “Dawn Raids” to remove by force unprocessed asylum seekers from their homes and put them into detention centres, the entire community would gather in protest to protect and defend their neighbours. The contributors to A Thousand Kindnesses have gifted Rachel their stories to share and are very happy she is now in a position to take their stories out to the world, although some wish to remain completely anonymous. Given the horrific racism and xenophobia that has broken out in Britain since the Brexit vote, we need people like Rachel campaigning for kindness and against racism more than ever!